I just wanted to check-in and let you all know about some of the amazing success we've been having here at Ms. Celiac Says... thanks to YOU (our readers) since we first hit the internet 7 months ago! Also, if you haven't yet checked out our shop, then you need to go see our great selection of creatively designed merchandise ranging in cost from $14.99 to $23.99. 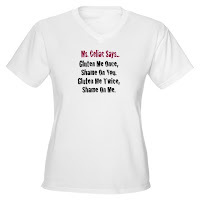 Go show off your gluten free pride at Ms. Celiac's Shop! And Ms. Celiac's Market now sells gluten free products from over 30 different brands. So, why not do your grocery shopping there?! Finally, I have some great gluten free posts for you to look forward to this week. Stay tuned!